What is it about them we love so much? Is it the mystery behind the container? The intrigue of the "you can look, but don't touch?" on burlap, inside an old shabby copper tray. It comes in many sizes and materials and has many uses. Your wire cloche makes such a pretty vignette! Adore your cloche vignette and the French history of the cloche! Beautiful cloche, Michele! Love the shape! The wire cloche is pretty. It is cool to put an actual plant in them. I love your cloche with the fresh green plant. They do look very nice with greenery. Absolutely beautiful!! Thanks so much for sharing and have a wonderful night! Such a simply beautiful cloche, Michele! I love it used the way it's meant to. I love your wire cloche Michele and you said it like it is. I love cloches for almost everything, but a simple plant is beautiful. Of course the burlap is wonderful also. Your cloché is one of a kind. I been spotting one of this but I didn't find the right one. Clever idea to put in the burlap. Perfect combination. Hope you have a great day and enjoy the rest of your blissful week. Hello my lovely friend, I adore your cloche it is just lovely. I absolutely love your wire cloche. I will now be on the lookout for one. All I have are some glass ones. 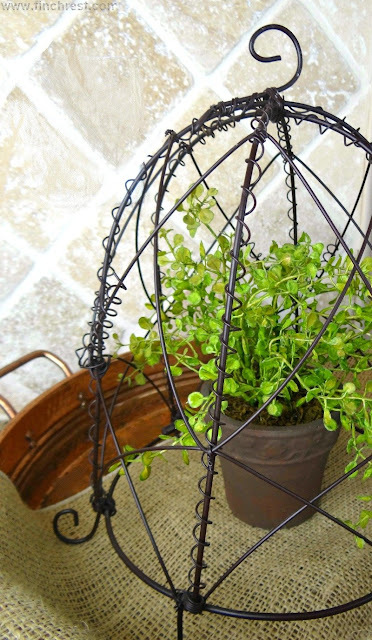 Your cloche is unique, who would have thought to use a copper piece with burlap, add a plant and wire cloche. Then done in a instance, love it so cute and creative. I like your cloche housing your plant. Is it a baby's tears? 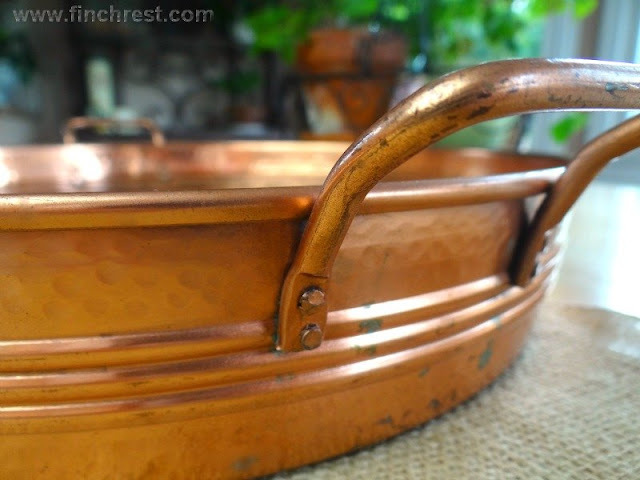 The copper tray is nice too. I am featuring some of my cloches below my tea party post if you would like to have a peek. Hope you're having a lovely week. What a pretty cloche...I love the simplicity! Beautiful job with this post. thanks for stopping by and your sweet comments. 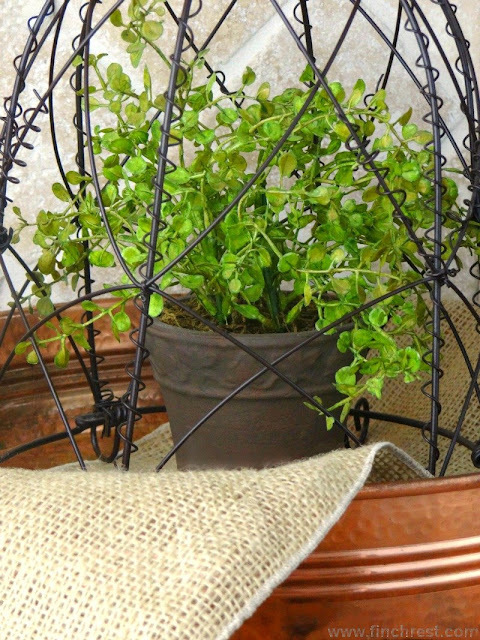 Really like your wire cloche and looks so pretty with the burlap, copper and plant. Cloches are so neat really. they do come in quite an array that I never realized until I started blogging. Also loved the pics of the sky from yesterday............God paints some awesome skies doesn't He?? Always breathtakingly beautiful!! THanks for the kind comment and I truly enjoyed your post on our amazing cloches... I learned something I didn't know... ~a beautiful bell! What a darling wire cloche! Love the simplicity of the plant and burlap. Thank you for visiting me...I am your latest follower. Can't wait to see what you do next. Your wire cloche is lovely! You're so right- "the beautiful bell!" I'm fascinated with them. I love your vignette! I'm now following. I can'y wait to see more wonderful ideas. Hi Michelle, I am amazed. I learn something new from blogging all the time. I must admit i have never hert of the word cloche. Intriguing story. Yours is beautiful .. I have a bird cage and have put flowers in that and through the bars.. its not a real bird cage but for decoration. I must look out for a cloche.. i like them. Oh how I enjoyed seeing your photographs. The vibrancy of the green plant under the wire is so striking. And sitting on the copper tray with that little bit of burlap is perfect. Thank you for the joy I found in your beauty. I love your cloche, you decorated it so pretty, the wire ones are so special, wish I could find one around here, but I haven't seen them. I love the information on them too, although I knew they originated in France, I know Spaniards always used them with saints and Virgin Marrys under them, even Jesus in the cross! I've seen them in old peoples homes. You're right, I love "the beautiful glass bells" and I can't stop buying them, the two bigger ones were a gift from each my daughters. Thanks for your lovely visit. Michelle, that so little can make a big difference. I think the glass clocks are so decorative! They fit so well with flowers, and they are just fine alone in the middle of greenery in the garden too. Like the little piece of coarse woven linen too. I hope you had a sunny day, thank you also for fantastic feedback on my previous post !! :)) I have collected another few cucumbers recent days.